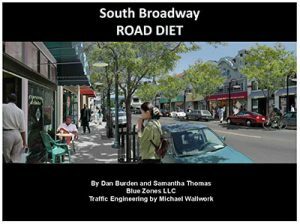 Dan Burden, with Blue Zones, was in Albert Lea January 9-12, 2015 to do a “re-visioning” of South Broadway Avenue from Main Street South. The purpose of this visit was to create a vision plan for the corridor to transform the street into a place that is more safe and accessible to all street users—people driving, walking, biking and shopping. Please note: In 2015, MnDOT will be doing a mill and overlay of South Broadway. This project will not include the roundabouts suggested in the presentation. These are long-term plans that will require public input and an additional funding source. Blue Zones and the City of Albert Lea are considering some modifications to MnDOT plans that may incorporate a three-lane corridor that will improve safety and parking along the corridor. We will be requesting MnDOT consider striping South Broadway from Main St. to 7th St. as a three-lane corridor that involves two drive lanes and a middle turn lane. The City may also be making some other requests to MnDOT that improves the overall flow of the South Broadway and Main Street corridors in the next five to fifteen years. Please click below to view a pdf of the powerpoint presentation.